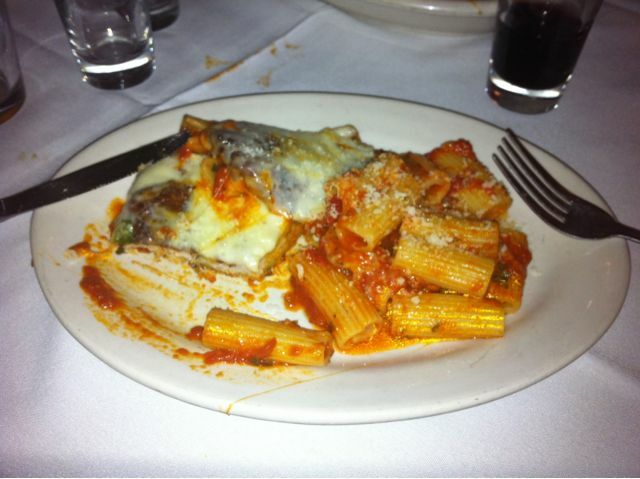 Veal parm over rigatoni at Carmine's. Carmine’s Restaurant helped to transform the Upper West Side when it opened in 1990. It brought Arthur Avenue-esque, family-style southern Italian cuisine to a residential neighborhood and basically exploded. It’s one of the most popular restaurants on the Upper West Side and is popular with locals and tourists alike. It is also frequently quite loud. And, of course, it is way, way off diet. With a friend in from out of town, and simplicity being a virtue, we settled on Carmine’s. We were all pretty hungry, having doffed a quick martini before stepping out, and ordered a Caesar salad, a side order of sausage as an appetizer, and the veal parm over rigatoni for the main. 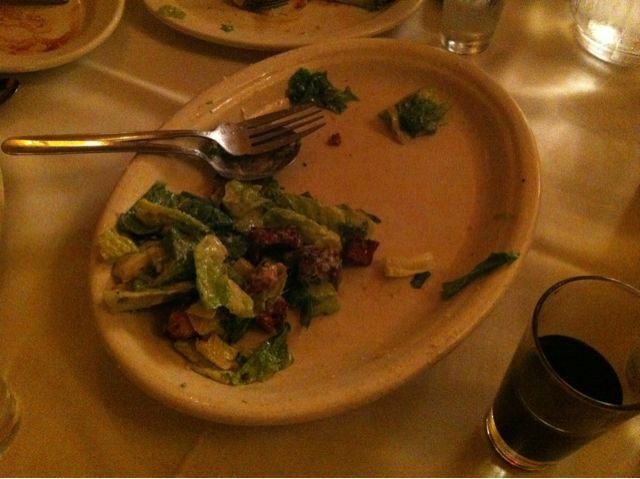 That used to be a large plate of Caesar salad. That was what was left after the three of us tore through it. I also should have a photo of the 4 fat sausages that came as our appetizer, but we ate them so quickly there was no opportunity to snap the shot. They were on the sweet side, and had a pleasant snap to their skin. Either way, back to the Caesar. At Carmine’s, the crisp hearts of romaine lettuce are pretty well slathered with the thick, flavorful dressing. Our server put the anchovies on the side, but we all indulged. A portion of the veal parm. 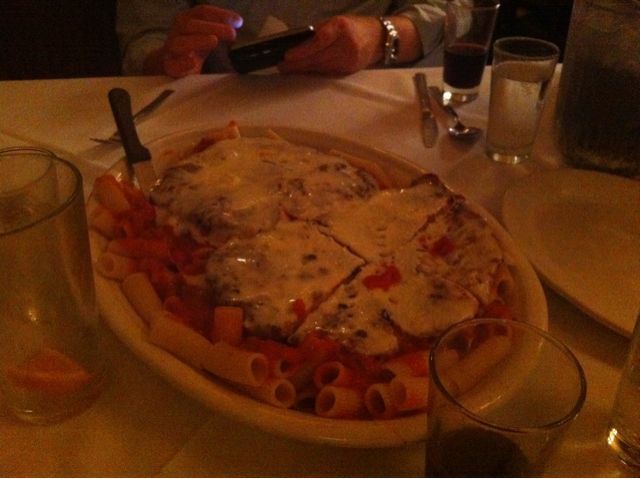 The rigatoni was handled very well – it routinely is – served nicely al dente. The red sauce is garlicky but also a touch on the sweet side. The veal is not particularly special, but at least it also isn’t too tough or dried out. What Carmine’s really has going for it is a solid level of overall quality, massive portion size, and fun (occassionally raucous) atmosphere. With Arthur Avenue so far out of pocket, it’s a wonderful resource I routinely use. Or used more routinely when I wasn’t on this diet and avoiding the dread white flour in pasta.